The blog Rambles & Randomness recently posted a "Well I Never Blogfest" so I'm going to give it a try with experiences related to science fiction (better late than never!). I never bought a copy of the Battlefield Earth movie after watching it in theaters, but I did buy the book and read it. I never knew that a 32X game I own called Spider-Man: Web of Fire is worth more than $100 until today. I never read Isaac Asimov's Foundation books although own some of the books and want to read them someday (I have too many books to read as it is). I never could get into Dune. I'm sorry. I never dressed up as a character at science fiction conventions, although I did enjoy seeing Darth Vader. That's all I can think of right now. 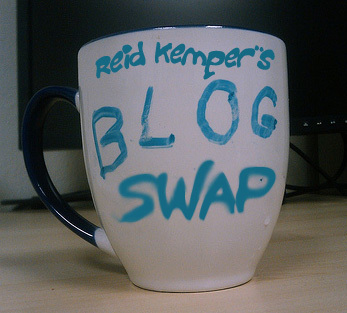 Also, as a reminder, December is "Reid Kemper's Blog Swap Month," so check out my previous post to learn about it and sign up! This CC BY-NC 2.0 licensed image was modified from a picture by Evan Hamilton. Do you have great blog posts that are buried in your blog and deserve more attention? Or do you have a new post that you think will be great for a wider audience? Or perhaps you want variety on your blog by sharing a post someone else wrote -- minus any hassle? If so, I designed this blog swap to help you out. 1. Enter your website URL in the list below to create a link. 2. Grab a post from my list of blog posts and use it for your blog. 3. Mention in the comments below which post you want to share in return. 2. Post your own blog swap on your blog. 3. List on your blog which posts you want to swap with those who participate. You can swap on any day. Think of it as reciprocal guest blogging. If you swap posts with me, I'll pick out one of your posts you listed and publish it on my blog. You may even write a new post meant for swapping. I'll credit you for writing the post I share and will link to your blog, so be sure to do the same. I will not publish any posts that have obscenity, controversial topics or anything else I don't feel comfortable sharing. Please provide a variety of posts that are not time sensitive to choose from. For instance, if you have a post promoting a book you published, this would be a great way to promote your work. It's also great to spread helpful tips or resources for others. You can choose which day to participate. You may use any post of mine before Dec. 1, 2011, for swapping, but below is a list of posts I recommend that are not time sensitive or are, to my knowledge, still relevant. Feel free to change any timely information (such as "today") and make edits. Want to Be Published? Here Is a Video with Some Tips. Reid Review: "Charles Yu's top 10 time travel books"
Have you heard of 'Exosquad'? Will Image Projection Glasses Be The New Future Crave? Funny Animation: "How The Empire Strikes Back Should Have Ended"
My website is licensed under a Creative Commons Attribution-NonCommercial-NoDerivs 3.0 Unported License, which means you are free to share any of my posts without having to ask me, regardless if you participate in this blog swap. But you must attribute the work to me and link to this site. You also can not use it for commercial purposes or alter the work (unless I say otherwise). Posts on this website before Aug. 4, 2011, are licensed under a Creative Commons Attribution-NonCommercial-ShareAlike 3.0 Unported License, which means the same thing except you are free to adapt these posts. You can find free science fiction e-books on many websites, but if you want some top-quality e-books, I recommend the Baen Free Library located at www.baen.com/library. Baen Books is a leading science fiction book publisher known for it's military science fiction novels. It also provides dozens of e-book versions of its published novels. So why does the publisher offer free e-books? One of the reasons is that if you read the first book of a series and like it, you may want to buy the other books. It's also compared to reading books for free at a library. If you like what you read, you may tell your friends and buy the books. There are many Baen authors who participate, so I've narrowed the list to ten authors who are among the best. They are in alphabetical order, and I've included quotes about the authors from the site (click on their names in large print to go to their page with free books). The links above will either go to a page that lists magazines or to one where you can search for magazines. Sept. 11, 2001, the date of one of the most terrifying terrorist events in U.S. history, will resonate in our minds for decades to come. The sight of two planes crashing into the twin towers of the World Trade Center, sending dust and debris among New York City streets, pierced our hearts with disbelief and sorrow on that day 10 years ago. Innocent people died that morning, including at the Pentagon and in the plane that fortunately didn’t reach the White House. It affected family, friends, U.S. citizens and others across the globe. It certainly was a mournful day affecting my life as well. What I learned that day was to appreciate life more and not to put my goals on hold. The understanding that life can be taken away in the blink of an eye was much more prevalent that day, and I was determined to live my life at the fullest. I worked even harder on my science fiction book and continued to write -- to finish it. I eventually completed it a several years later despite a full load of college; unfortunately, I wrote it longhand, and it was more than 700 pages long. I considered it sufficient training for writing my second novel, so to this day, I've never typed it all up. Don't worry, I'll type and rewrite it some day -- and divide it into three books while I'm at it. As for my second novel (or fourth depending on how you look at it), I typed it from the start (thank God). I'm more than halfway through writing it, and that story, too, likely will be divided into three books. Unfortunately, I haven't written on the novel in a year and haven't written anything significant in two. I lost that passion to finish what I started -- the passion I had for years after the Sept. 11, 2001, attacks. Sure, I wrote short stories and blogs in my free time, but something was missing. My complete story was missing. I'm hoping to rejuvenate that spark I had. I'm hoping to finish what I started. How did Sept. 11, 2001, affect you? I recently navigated through my selection of unread books on my e-reader and picked out a random story to read. That book -- actually a novelette -- was The Armageddon Machine by Simon Kewin. The story is self-published, so I paid close attention to the first page to see if either 1) the author had no talent, which is why he self-published, or 2) he was someone with great talent using self-publishing as a tool to build readership and notoriety. I'm glad that he fell into the latter category. Click image for e-book info. In fact, I venture to say that this is the best ebook I've read in quite a while. The story grabbed my attention from the very first sentence, "Mackenzie watched the universe end." As I read on, I was whisked into a science fiction world that reminded me of Star God by Allen Wold: Sure, The Armageddon Machine may have needed more editing and may have had some unanswered questions, but it was good, nonetheless. After reading the roughly 13,000-word story in one setting, I wondered why the story wasn't published by a traditional publisher. I gather that it is difficult to publish work at that length because it is too long for most magazines and too short to be a novel. Perhaps Kewin could expand the story into a novel. I think it would work well that way, would answer many questions and would give him more time to develop the characters. I didn't find out about the Mega Mega Legends 3 video game being in development for the Nintendo 3DS until writing my June 6, 2011, blog post about my top three favorite games. I also didn't find out about the game's development website (www.capcom-unity.com/devroom) until after the game was canceled. So if lack of participation in the development website was a factor in canceling the game, it seems to me that the video game company Capcom didn't do a sufficient job letting the public know about it in the first place. Hopefully, either Capcom resumes the project or CyberConnect2 (which created the .hack series) takes over (its CEO expressed interest in doing that). If so, they should rerelease Mega Man Legends 1 and 2 (and, if they want, The Misadventures of Tron Bonne) on the 3DS to get new fans of the series. There are plenty of younger people who have never played the first two games, and, hypothetically, they wouldn't play the third one if it came out because they may want to start with the beginning and can't do so without a PlayStation or Nintendo 64 video game system. Even if work on the third game is not resumed, a package of the first two games would garner more fans and may spur more interest in a third title. It also would interest new fans in other Mega Man games (as was the case with me when I was younger). 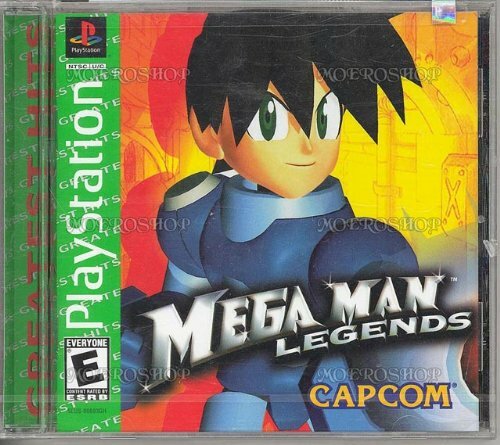 Mega Man Legends was the first Mega Man game I bought. I picked up a free pamphlet of the game coming out (or already out -- I can't remember) at my local EB Games store. I liked what I saw and bought the game. It became my favorite game almost instantly. Then I told my friends at school about it, and they also bought copies. I even found the Rockman Dash Original Soundtrack CD and bought that as well, playing it constantly. We had a joke back then that I was using the "Apple Market" song, which I called "the town music," as a mind-control technique. It goes without saying that I bought the other games, including Mega Man 64 (which is a rerelease of the first Mega Man Legends game). I then bought other Mega Man games, in which before Mega Man Legends, I had no interest in them. My point is that if Mega Man Legends 3 is finished and sold, it may start a chain reaction, and it likely will produce lots of sales for Capcom -- not just from the Mega Man Legends series. I hope that the Mega Man Legends 3 project will be resumed. Do you know of any other games in development that you were interested in but were canceled? I found quite interesting an article on io9 on Aug. 11 titled "Breakthrough: Electronic circuits that are integrated with your skin" (http://io9.com/5830071/breakthrough-electronic-circuits-that-are-integrated-into-your-skin). Picture is from io9 and other sites; origin of photo is unknown. But the idea isn't new. Technology for flexible chips has been around since at least 2006, chips have been implanted in the skin since at least 1998, science fiction have used the idea of implanted technology since at least 1972, and there's prophecy—about a time when mankind cannot buy or sell without a mark on the right hand or forehead—that dates back to the first century. "Stream of Consciousness" is a micro fiction story I wrote scheduled to be in the online publication "Flashshot" today. The micro story takes place in my nVoidz universe -- er, I guess it should be "omniverse" since it deals with multiple universes and dimensions. "Humans have been extinct for millions of years. However, before their demise, they created a living machine called the Consciousness. This being of thought in turn created ghostlike beings called Overseers whose purpose is to unlock and harness the powers of the omniverse (multiple universes). By fusing the dimensional powers of a universe into adaptable alien chromosomes, they created nVoidz, self-efficient beings with universal powers such as light, gravity, friction, and other fundamental abilities." Read the micro fiction story here and check out the "nVoidz Omniverse" tab on this website for more information. With more Marvel and D.C. comics movies coming, I'm strangely reminded of Saturday morning cartoons. That's likely because I was introduced to the superheroes that way. But there are other cartoons that deserve attention. Have you heard of "Exosquad" ? I came across the science fiction cartoon series on the video-streaming website Hulu.com. Then I remembered that I likely own a DVD of the show that I may have bought for a dollar (which I haven't watched) and that I had owned an action figure of an E-frame (mech) when I was a kid. There also is a Sega Genesis game based on the cartoon that I remember seeing in the past. I bid farewell to the space shuttle program. This doesn't mean there won't be any space travel, however. The International Space Station is still in orbit and in operation. It seems that NASA's next big mission is to send mankind to Mars by the 2030s, since a bill was approved in September to go in that direction. See the article on Space.com here. At once considered a thing of science fiction, a trip to Mars is possible and welcomed. Let's hope the idea of Martians stays with science fiction. For a video of space shuttle Atlantis' astronauts getting a wake-up call from band R.E.M. 's Michael Stipe, click here (the video is on the NASAtelevision channel on YouTube, but apparently, the audio doesn't work if shared to another website). The astronauts are taking a break today, but should return July 21 at NASA's Kennedy Space Center in Florida, according to "Shuttle Astronauts Take Much-Needed Break from Busy Mission" by Denise Chow, Space.com staff writer. Happy Independence Day! And you can tweet that! To my fellow Americans, happy Independence Day! 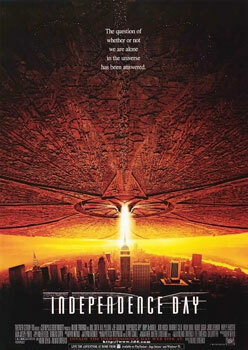 I doubt there will be an alien invasion like what happened in the 1996 "Independence Day" movie, but, hey, I can't think of a better Fourth of July science fiction reference. Comment below if you can! To those of you from other countries, I hope you have a great day as well! And to everyone who tweets (or just follows them), check out my newly created Twitter page. You are welcome to tweet my blog entries. There have been so many science fiction books published that it's impossible to read them all (unless you're really an android). So I'm going to highlight a little-known book by a big-time publisher. 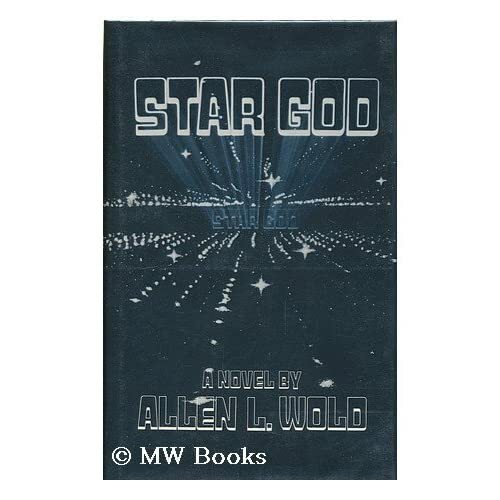 It's called Star God by Allen L. Wold, published in 1980 by St. Martin's Press. Although I believe Wold considers his Planet Masters series better, I haven't read those. Also, it's been a while since I read Star God , so I'm mainly going to discuss what the story is about rather than get into minute details. Frankly, one of the reasons I bought the book is because I liked the title. That and I've met the author at a convention. The short blurb on the back of the book didn't interest me. It says, "There is a strange force at work in the universe. It must be stopped. But first, it must be understood." It seemed too generic and vague, but after reading the novel, I realized how true that phrase is. Today (May 14, 2011) is George Lucas' 67th birthday. He's widely known for creating Star Wars, but THX 1138 was the first feature-length film he directed. It was based on a short film he did in 1967 as a student at the University of Southern California. So let's wish him a birthday blast with some THX 1138! 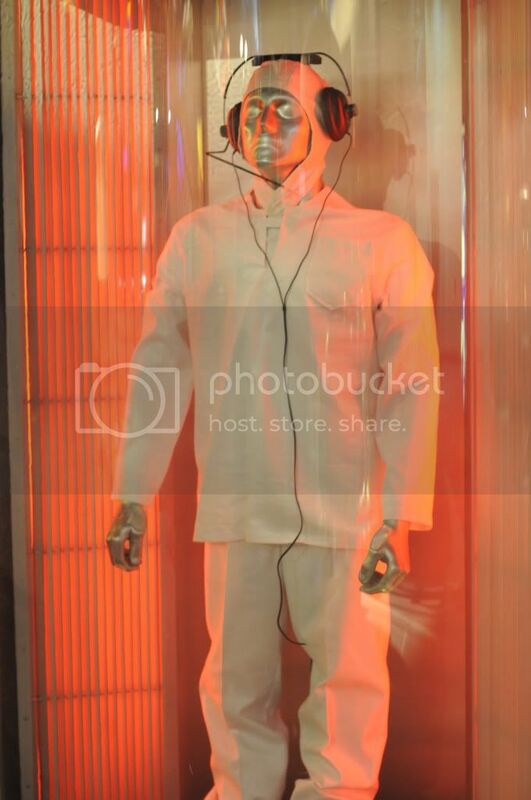 THX 1138 costume from moviemaker29 on photobucket.com. I had originally thought about posting a Portal 2 video game trailer before the game came out, but it was shown a lot on TV, so I opted to wait until the game was released before talking about it. Naturally, I wondered whether the game would flop or exceed the high standards the first game set. It did the latter, and top video game reviewer IGN.com gave it a 9.5, rated higher than its predecessor. Essentially, Portal 2 is a first person science fiction puzzle game. You use a portal gun to travel from one place to the next to solve puzzles. There also are new puzzle elements introduced. It's available for the PC , PS3 , and Xbox 360 . I hope everyone had a Happy Easter! Picture from incomT65 on photobucket.com. 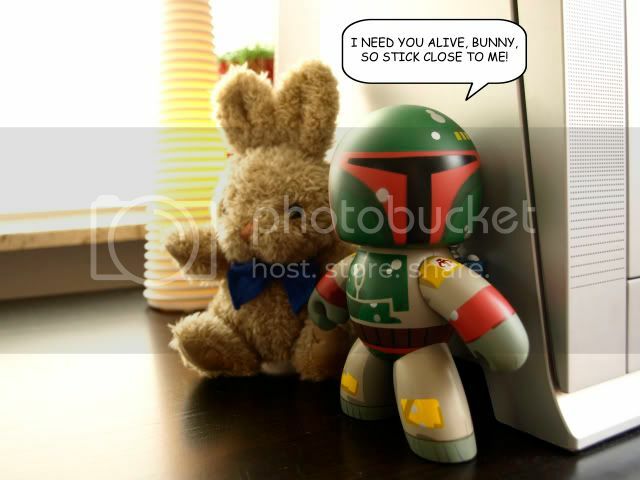 I guess chibi Boba Fett from Star Wars needs the bunny alive to collect on the bounty. It can be tough submitting your writing for publication, but don't get discouraged if you keep getting rejections. Editors and publishers have different likes and dislikes. You should also keep a record of your submissions. David M. Harris, who "has taught English at Vanderbilt University and elsewhere," according to the description of the following video, shares this advise to whoever aspires to be a published author. He also gives helpful websites. One such website is ralan.com, which lists science fiction and other speculative fiction markets. A saw a video of odd news from Yahoo News that I'm going to share. It includes an alleged sighting of a Bigfoot as well as the existence of a Chupacabra being debunked. There also is a man named Moses Lanham Jr. who can turn his feet backward. Lastly, Drew Beaumier wants to market his "morph machines," or Transformers suits, that can transform and drive. Beaumier was on American Idol with the suit. It's good to know that the science fiction cartoon and now movie series Transformers has such a devoted fan. I'm sure he gets lots of photo opportunities. And since Beaumier is the star of the video, as a tribute to him, here's a trailer for the next Transformers movie coming to theaters July 1. 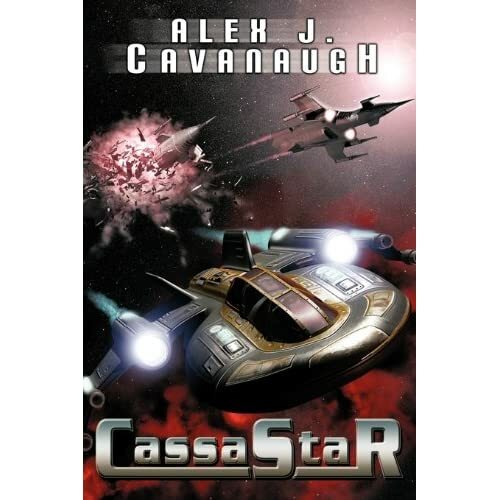 I recently read Alex J. Cavanaugh's debut novel, CassaStar, so I am going to give an honest review. Although Alex is a member of this blog, I was not asked to review the book, and I avoided reading reviews of the novel so I'd have a fresh perspective. Imagine Orson Scott Card's Ender's Game with a young adult protagonist instead of a child and starfighter training instead of zero-gravity drills, and you have the basis of CassaStar. They both are about a tactically brilliant person who feels discredited by his instructor despite being the best there is. From there, the books differ in many respects, and CassaStar has a different edge that makes it unique. Before I proceed, be warned that this review will contain some spoilers. Ultimately, I recommend the book, but it's not without its flaws. If you plan on buying it and don't want spoilers, stop reading this review and visit http://dancinglemurpress.com/id19.html for the book's blurb. Otherwise, continue at your own risk. Perhaps you'll want to read the book after learning more about it. Today is Daylight Saving Time in the U.S. and what would have been science fiction writer L.Ron Hubbard's 100th birthday. Although he's the controversial founder of Scientology, he's written many bestselling science fiction stories such as his Mission Earth series and Battlefield Earth (the movie is horrendous, though). He also started the Writers of the Future contest for new writers, which has great judges such as Kevin J. Anderson , Gregory Benford , Anne McCaffrey, Orson Scott Card , Eric Flint , Brian Herbert , Larry Niven , Jerry Pournelle , Robert J. Sawyer , Robert Silverberg , and Dave Wolverton . If your interested, judge Dave Wolverton (pen name David Farland) offers daily writing tips through his website: www.davidfarland.net. Although Hubbard died in 1986, I'm glad the Writers of the Future contest has continued to help many great writers become successful. What are your opinions?